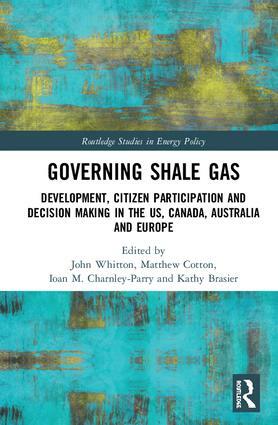 Matt Dairon, John Parkins and I now have a chapter out on Matt’s Masters work at U of A in Governing Shale Gas: Development, Citizen Participation, and Decision Making in the US, Canada, Australia, and Europe. Our chapter is near the back, chapter 17 of 18: Seeking common ground in contested energy technology landscapes: Insights from a Q Methodology study. While the book is about shale gas, this case study uses the same concourse as another recent paper, but in sites of shale and wind farm development in southwestern Alberta, and with interviews to bring nuance.